No matter the terrain or season of the year, LUVERNE running boards and side steps are made to keep up with your hardworking lifestyle. 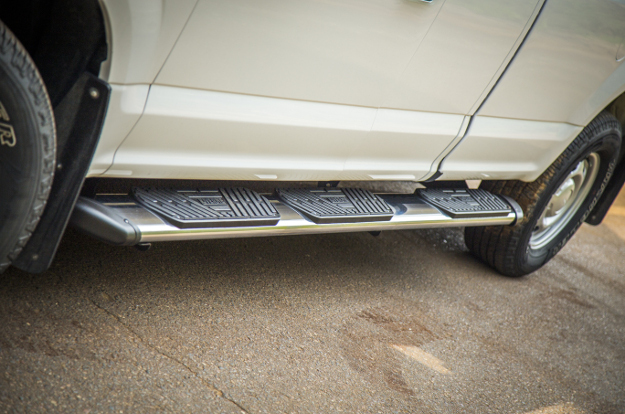 From our professional Grip Steps™, to our aggressive O-Mega II™ side steps, to our classic Side Entry Steps, our running boards are built on the cornerstones of American manufacturing, long-lasting construction and a vehicle-specific fit for each truck, SUV or cargo van. The majority of our running boards and side steps are available in cab-length and wheel-to-wheel applications, and many are designed for a no-drill install. 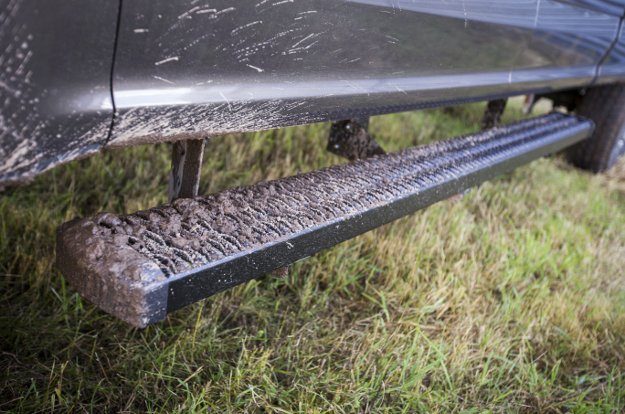 These ready-to-work running boards are ideal for commercial trucks and cargo vans. They feature high-traction expanded metal treads for unparalleled safety on the job, and they're made from powder-coated aluminum to be strong, lightweight and rust-free. Grip Step™ running boards are completed with smooth rounded end caps to eliminate sharp corners for added safety. 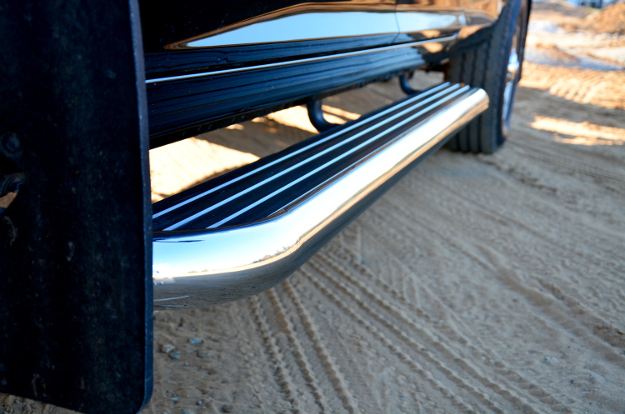 Designed for ultimate comfort and a deluxe look, Regal 7™ oval side steps are the widest nerf bars on the market. They feature extra-wide, non-skid step pads and bold, contoured end caps. Regal 7™ pickup truck side steps are constructed from stainless steel and are available in two finish options: textured black powder coat or polished stainless steel. These classic truck running boards mount high-and-tight against the rocker panels, providing an integrated look and extra side protection for the truck against gravel spray. Side Entry Steps also feature non-skid step pads and bold black end caps. All sets of Side Entry Steps are constructed from stainless steel and are available in two finish options: polished stainless or black powder coat. Box extensions are also available for a wheel-to-wheel step option. 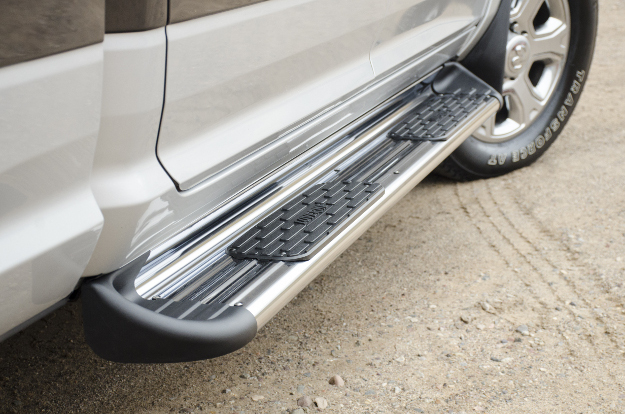 These hardworking side steps combine the stylish look of popular nerf bars with the functionality of full-length running boards. They feature high-traction rubber treads for a safe, non-skid step on the job, and their polished stainless steel front trim adds a bright, professional accent to your truck or cargo van. 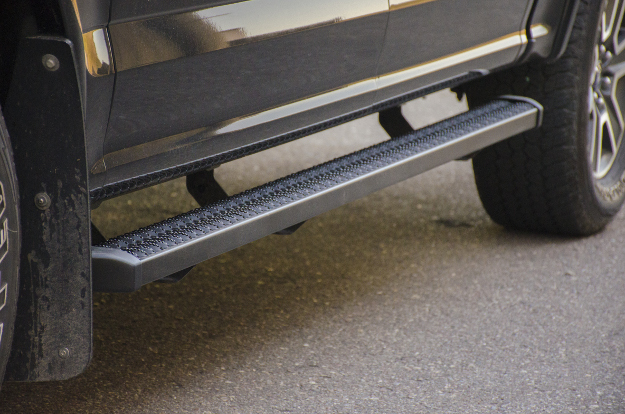 MegaStep® running boards are built with an aluminum base to easily outlast corrosion and maintain a lightweight design to promote optimal fuel-efficiency on your vehicle. These aggressive and highly durable running boards are perfect for work vans and offroad trucks alike. The boards and step pads are both constructed from powder-coated aluminum, making them a long-lasting and highly non-corrosive step. O-Mega II™ side steps provide fleet-grade safety with their raised, circular aluminum treads and customizable step pads. 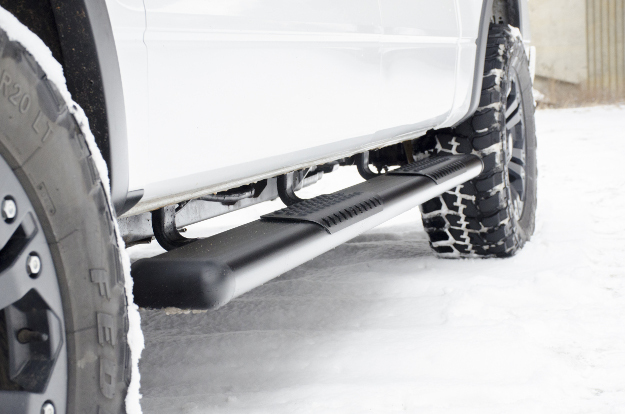 These offroad running boards feature a unique combination of sleek style and rugged construction. They are made with the same fleet-approved, high-traction metal treads as our Grip Steps™, but they feature a narrowed design and angular end caps for an aggressive, custom look. SlimGrip™ truck running boards are built from powder-coated aluminum for maximum longevity on the trail and a strong, lightweight step for your truck. For select cargo van applications, a number of our running boards are available in a rear step configuration. 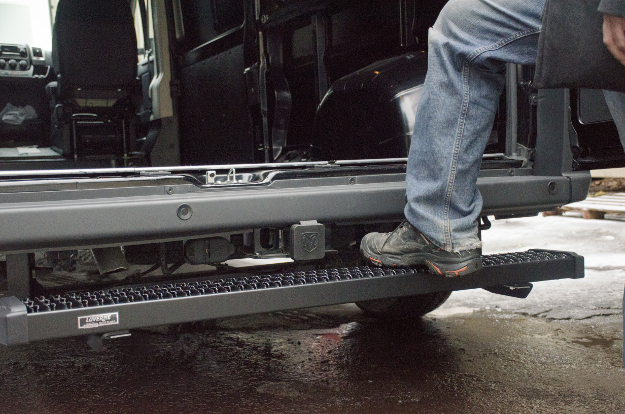 A rear step is a running board that mounts onto the back and provides safe, ergonomic access to the rear cargo area of the work van. Rear steps are particularly useful for delivery vans and other commercial vans that require frequent entry and exit from the rear. For added functionality on any truck, SUV or cargo van, we offer hitch steps for several of our running boards and side steps. A receiver hitch step is a shortened running board equipped with a standard 2" shank to easily mount onto a trailer hitch whenever needed. 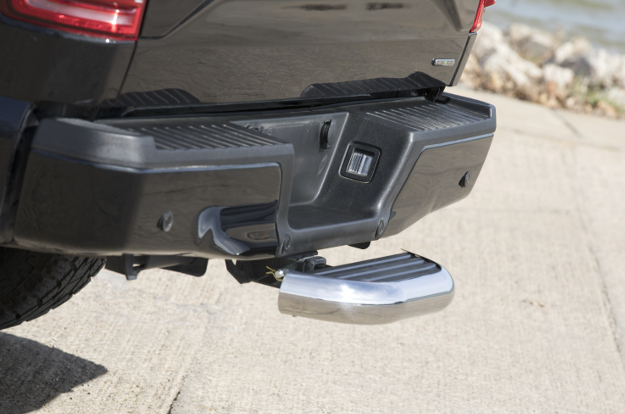 Receiver hitch steps provide easier access to the rear cargo area of a van or a helpful step up when reaching into the pickup truck bed. They can also be mounted onto the front of the vehicle for easier under-the-hood access.